The first Tumlare built in Australia was launched in September, 1937. By November of that year, five more were launched and made ready for the start of the sailing season. From these modest beginnings began the relatively long-lived Tumlare one-design class in Australia, a class that has held together for a remarkable 70 years and which continues to provide keen and competitive racing today, still able to establish and break records. The Tumlare was designed in 1933 for a couple of young Swedish yachtsmen by Knud H Reimers in Stockholm. The design has been described as being years ahead of its time, having many aspects now common to modern thinking. The boat has a high-aspect ratio rig of three to one, relative light sheet loading, and a light displacement hull with a low wetted surface for better performance in light airs. A high and strong turn of the bilge (giving reserve buoyancy), slack sections and a ballast ratio of 53 per cent also allows for speed in fresher winds. The club was after a class yacht that could be built at a reasonable expense, within the reach of all yachtsmen, that could be handled by a small crew but would still stand up well to all conditions. A late inclusion in the list of contenders was the Tumlare. The yacht’s lines had only just been published in Yachting World Magazine that year. The prominent yachting heads that got together, including a delegation from the Royal South Australian Yacht Club, which incidently was also interested in forming a one-design class, unanimously adopted the Tumlare, but recommended that timber frames instead of metal should be used “to avoid corrosion and prolong the life of the craft”. Bert Ferris says that the Tumlare thus “became the first one-design displacement keel boat class to be introduced in Victoria. Two orders apiece were placed there and then with Clausens of Adelaide (which built the first Tumlare, Acklorean), J J (Jack) Savage and Charlie Peel, both of Melbourne.” The average cost for each of these boats ended up being about £275, and the two ordered through Peel were built side by side and launched a fortnight apart. Only one Tumlare in Australia is built to the original designs with steel frames. Bill Gash is, by his own admission, a relative newcomer to the Tumlaren. Being “the best side of 70” at the time of being interviewed in the late 1990s, but now passed away, he first started sailing “Tums” about 25 years ago. Since then he has won thirteen state championships, mostly in the 1938 built Avian. His racing achievements would be the envy of many, but his experiences out on the water could fill many a young sailor’s journal with red ink. “Once I broke a mast in a 60 knot breeze. That was about eight or 10 years ago. We should never have been out racing. We were sailing with main and working headsail, went over a sea and ‘bang’, the mast folded in two places. Hardly an event to be envious of I know, but memorable, as would be having a great hole punched through your bows. “We were racing in a championship and I think one of my crew got tongue tied. He was calling the shots. We were on port tack and I yelled ‘How are we going?’ and he said we’d clear him, that we were in front. Of course I couldn’t see him for the sail. Then I say, so how are we going?, and he’s not talking back to me, and I say ‘Come on, talk to me, tell me’. Then I get a look at him and he’s open mouthed, trying to get words out and couldn’t. And then it was ‘BANG’. “The other boat pushed its bow in one side and out the other. The big metal fairlead on the other boat protected it. Not a scratch. Of course we threw her up straight into the wind, turned around and came home. We were lucky to get home. We took everything we could find and stored it down aft. With one bloke on the pump, and we were souping every sea in, the boat was still very low down in the water. When we got her back on the moorings we rowed back a lot of anchor chain and left in on the stern. The colouring of these boats provided a curiosity for Australian waters at the time. “One was painted all white on the starboard side with a red boot top, and green on the other side,” says Bert. Another boat “had a white bottom and green topside on one side, and the same reversed on the other side, with a red boot top.” In 1940, Avian, “painted the untraditional colour at the time of red”, provoked the disapproval of the trustees by having made a balloon spinnaker. Although this one was let through, no further such sails were allowed at the time. But during these war years, concessions had to be made on a number of fronts. Bob French worked as a boatbuilder for Savages at Williamstown in the 1940s, and remembers working on the Tumlare Snowgoose, now renamed Yeoman. Bob, now 75 and retired, says that Snowgoose was planked below the waterline with New Zealand kauri, but had spruce above, as it was then impossible to get good clear oregon. “This was made thicker, as it was lighter,” he says. “A lot of them were planked with oregon, when it was available before the war, and some with huon. In South Australia a lot were made with oregon.” Bob makes the interesting point that Savages had a general policy of not allowing stealer planks to be fitted, and this of course applied as well to the Tumlarens built there. If an engine was fitted, which is very unusual, it had to be offset. “There was not much room down there,” Bob says. “They were very bare inside when they left us. Just a couple of benches, four foot nine (inches) headroom and a small forward hatch.” But otherwise, Bob says the Tumlarens were basically a straightforward double-ender, “just a bit finer than most”. Planks were set tight inside with one sixteenth inch allowance outside for caulking. “Three strands of cotton were put in for caulking,” Bob says. “The timber decks were canvassed to make them watertight, as was the top of the cabin. “Floors were spaced about 18 inches apart, but they were put in first and bolted through the keel. This was about nine inches wide and 15 deep. The war basically stopped development of the class, but racing was carried on with the help of interstate and overseas yachtsmen on leave from the services. For security reasons, crews had to be issued special permits to be on the bay. “Crews were hard to get,” says Bill Gash. “Racing was restricted, and we survived by personnel out of the army or navy that had sailed. They would come down here if they were on leave for a weekend and then, well, off they’d go and you’d never see them again.” Bert says that the Tumlare thus ended up being the only keel boat class to be actively raced regularly during this period. Interestingly, the idea was floated at the St Kilda club to build and raffle a Tumlare each season, but after looking at the legality of raffles and risk to the club, the idea was abandoned. Since 1950 interest had been developing in other states, with a good fleet in Adelaide, three in Sydney and six more in the pipeline, one in Fremantle in Western Australia and one being built in Hobart, Tasmania. By this time, owners and skippers had been getting together regularly to exchange tips on racing kinks and other general hints, although Bert says a formal association was not formed until 1967. Since the class had for years been used solely for racing, it was decided in the 1957-58 season to modernise. Winches were finally allowed and the cabin top was opened by removing the after bulkhead and reducing its length by 450mm. “They took the top back to the after edge of the opened sliding hatch,” Bill says. “Of course all these changes had to go through the trustees. I think they wouldn’t let the first one thus altered to race in the first year, but then everyone started to do it, so they had to relent.” The spinnaker pole was shortened by one metre, to make it more manageable, and the foot of the genoa was cut back by 350mm. “These changes improved the workability of the craft,” says Bert, “and gave the crews a better view of what was going on.” It was during this season also that one skipper introduced a spinnaker turtle (bag), which Bert says was one of, if not the first seen in Victoria. Boat owners got together in 1958 and lobbied for synthetic sails, which were allowed the following season. The two top mainsail battens were also extended through to the mast, but it was to be another 10 years before rope luffed mainsails were to be approved by the trustees. In 1968, the recently formed Tumlaren Association made a push for the introduction of alloy masts. Some of the skippers were concerned about the strain on the ageing hulls. The idea was shelved for the time, although it was agreed to allow external mast tracks to accommodate rope luffs. An attempt was made in 1965 to ban the practice of having crew members on the weather deck, as it was considered unsporting. But by the mid 70s, positioning of the crew on the weather side was so common, it would have been impossible to make a ruling otherwise. The seaworthiness of the design has been proven on many an occasion. Bert Ferris says that up until the advent of modern ocean racing ratings, Tumlaren were consistent ocean racing entrants. 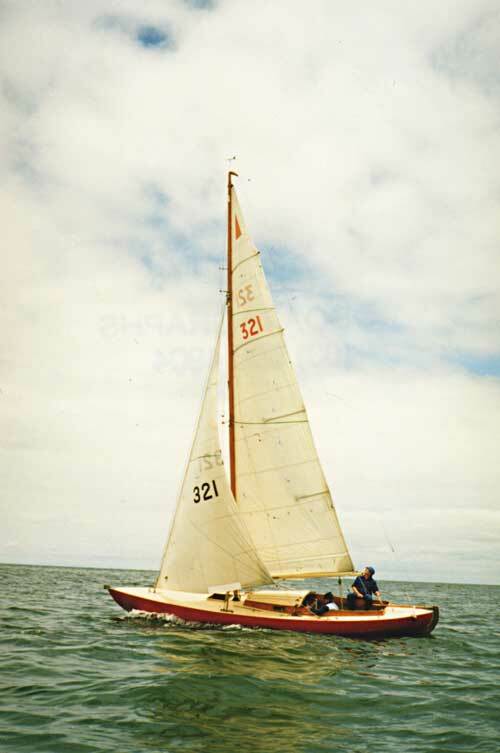 Haze, amateur built in 1950 in Western Australia, won in her heyday every ocean race in that state. One such race, in adverse weather with fears for her safety, Bert says, Haze achieved the remarkable feat of being the only yacht to finish. The designer sent the Tumlaren Association a commemorative plaque in 1983 to mark the 50th anniversary of the class. To celebrate the golden anniversary of the Tumlare in Australia, the plaque was mounted and presented as the “Knud H Reimers Trophy” and was won by Avian for the first time in 1987. “You’d never build a Tum today you know,” says Bill. “With the cost of copper and timber and everything like that, you’d never justify the expense.” There were four Tumlaren for sale on their moorings at the time of writing, and Bill seems to think that the relatively cheap prices being asked for them has a lot to do with the sort of owners that have tended to buy these boats recently. “I contend that people see them sailing out there, and they are impressed by them. They walk down the pier and they say, ‘Look at that boat, I’d love to be able to sail one of those’. So the guy goes and buys it, ’cause he’s found one that’s cheap – $6000 – and says ‘oh I can afford that’. So he buys it and his wife says I’ll come out sailing with you, on a nice day, but then it becomes a wet day, and she doesn’t like it so much. She says I’m never going out there again. “So he leaves the boat on its moorings, and it deteriorates. Somebody else walks up the pier and they say ‘Look at that boat, I’d like one of those boats’. So he goes and buys a run-down boat – for less. Is there anything Bill would like to see different on the Tumlaren? “Yes,” he says, “about three boats in front of me! It’s a challenge. Like, when Selim was sailing we had real ding-dong goes. If you won a race by 30 seconds, you won by a mile. “I’d like to see a lot more competitiveness. The best race I’ve had in later years was with Vahine, Ettrick and ourselves in Avian, finishing in a state championship heat. I was in the middle, trying to cover both and I thought I’ll let Vahine go and I’ll stay here with Ettrick . Vahine went out to the west, and he beat us across the line by two seconds and we beat Ettrick by three seconds. So you had three boats across the line in five seconds.